Is this a back-up plan for a long-term company success? Airbnb Belo logo inspired by “Belong anywhere”. I am really amazed by ‘Experiences’, Airbnb’s new service. Officially released last week, it’s currently operating in 12 cities around the world with more than 500 experiences to be booked instantly. … yet scrutinising the company’s past activities and challenges, I am starting to think that this so-called ‘logical step’ for Airbnb seems to be a survival step — rather than just an initiative to scale. Since they went live on Facebook, I’ve started to lure around the platform to see the possibilities of being a host in my city. Through the extremely intuitive and amazing platform design, I rapidly found that every host has 3 choices:- to host its own place,- to co-host for their neighbours, and lastly, - to create an experience for travellers. Perspective — to create an experience of personal significance for the traveller. To participate in the activities listed under ‘Experiences’, hosts and guests must verify their identity by scanning their ID, passport or driver’s license, as well as by snapping a selfie. The platform is collecting 20 % cut from the revenue from activities (except those with non-profit) — compared to 3% which it collects for hosting services. They also plan to cooperate with non-profits, and are considering ways to add various opportunities, including, but not limited to: booking a car ride, reservations in restaurants, and even delivery of groceries, creating whole new possible markets and competitors for the business. With $4 billion in funding, they are valued at $30 billion now. Experiences Tab on the official Airbnb page. All this looks stunning, doesn’t it? Beside the option of renting your own place, you can get extra money to sell something you already do or love! So, what do I want to point out? Don’t get me wrong — services like this are the next step in a sharing economy that will strongly influence human relations and how we perceive places we travel to. But, since the company started, they faced many obstacles (most of them regarding racism); safety precautions issues, terrible accidents, even deaths of guests — and lots of legislation challenges, primarily focused on travellers’ short rental stays. And, even though Airbnb is mainly considered (and widely promoted) as a platform for social movement that creates an affordable experience and tries to overcome the ‘stranger means danger’ bias, they are having issues with their fast-pace growth and venture profit sustainability. And they NEEDED TO MOVE FAST. 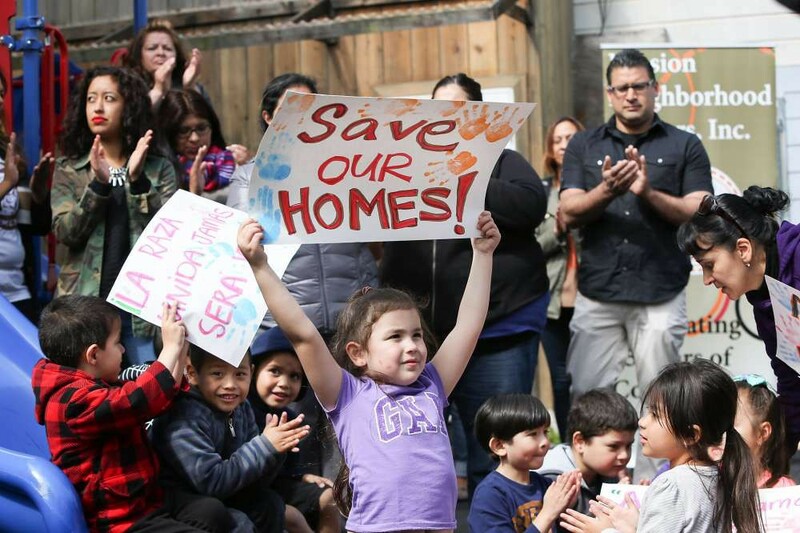 Children from the Mission Neighborhood Head Start Preschool hold signs during the press conference where Supervisor David Campos announced an ordinance calling for a temporary moratorium on construction of market-rate housing in the Mission. From this perspective, the logical reasoning behind this change in Airbnb’s business model is trying to solve the problem that influences cities and countries in an uncomfortable way: locals are forced to pay bigger rents and are struggling to find a place to live because of the increased amount of travellers renting the available space and paying more for short term stays. But, in the latest public announcements, they are putting travelers on the spot (not locals), explaining their thorough journey investigation process with the creation of detailed action storyboard based on real travellers and real trips. Apparently, Airbnb saw that most of tourism is boring, and that travellers need memorable, if not extraordinary, excursions. As a back up plan — if plan A fails, the business pivots and its main profit stream switches to the ‘Experiences’ strategy, where legislative issues and related problems won’t be an issue anymore, creating viable future for the business. With Brian Chesky statement, the company’s chief executive, calling this “The most significant development in eight-year history”, Airbnb is prompt into taking measures of dealing with business risks. In this (forever) changing world of technology, they for sure had to reinvent their business model to adjust to local community needs, as well as to put an end to regulative problems and maintain future business prospects. They are also partnering with other startups, making their community stronger (check Detour, it’s amazing) and they are among the few companies that will (hopefully) stand between the human relations and robots in the future, so that is a good way of dealing with challenges in the modern world. What do you think? Is this just another revenue branch for Airbnb, or just an inconspicuous pivot from their original service, planned to switch their ‘Plan A’ of income generation sometime soon? The facts in my text are mostly collected from: top 10 results on Medium when searching for keyword: Airbnb, from the official airbnb site, the NewYork Times post, VanityFair post and Fortune post. I am a huge fan of the mission that Airbnb is striving to accomplish and this is my opinion based on research on the Internet. Good to know: I don’t have any connection with promotional or any other activities with the company Airbnb. If you like the post and want to read more posts like this, don’t forget to click the heart bellow.